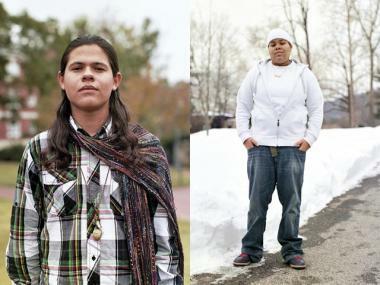 Patrick, 18, of Auburn, Ala. and "Hot Sauce," 17, of Nyack, N.Y. tell their stories in We Are the Youth. MANHATTAN — In the heart of Pride Week, a photojournalism exhibit on display at a SoHo gallery is putting the focus on portraits of lesbian, gay, bisexual and transgender young people from across the nation. The project "We Are the Youth" at the Leslie-Lohman Museum of Gay and Lesbian Art on Wooster Street began two years ago, when photographer Laurel Golio and journalist Diana Scholl, childhood friends who live in Brooklyn, started talking about combining forces. "A few years ago ... people were coming out earlier and [LGBT young people] were something that people were talking about more and more," said Scholl, who grew up in Ossining, N.Y. The pair wrangled introductions to youth through student groups and nonprofits in New York, raised $2,500 to support the project and went on the road to conduct interviews and take photos in Georgia, Alabama and Mississippi. "We tried to capture diversity of all sorts — of gender expression, race and religion," Scholl said. "And I tried to keep the essays in people's own words as much as I could." The pair participated in a teen art night at the Brooklyn Museum this winter, Scholl said, and caught the attention of Leslie-Lohman, which in December became the world's first LGBT art museum. Two years into the project, they have created more than 50 photoessays, eight of which are on display at the 26 Wooster St. museum. An Alabama teen said his father found out he was gay by reading his Facebook account. A transgender Bronx woman said her biggest supporter has been her grandfather. And a California teen said she identifies as "queer" because eliminating an entire gender from her choices of partners seems odd. Scholl said she hopes to draw attention to the struggle of youth who can be more vulnerable than most. "We're thankful to be part of a movement that's taking place to validate these stories," she said. For their next stop, Scholl and Golio have their eyes on the Midwest and are fundraising for a trip there now. Before long, though, the photoessays in We Are the Youth could tell a different story. "We are in a time period where gay rights are changing so dramatically, as we see in [public opinion] polling on gay marriage," Scholl said. "In 10 years, this project could look really different." "I don't think you'll see the same amount of struggle then. I hope it will get easier." Leslie-Lohman Museum of Gay and Lesbian Art at 26 Wooster St. is open Tuesday through Saturday from 12 noon to 6 p.m. Admission is free.